Three-hundred and fifty college students, administrators, alumni, experts and community partners from around the country came together at Harvard University to celebrate the first-generation college student identity during the second annual Inter-Ivy First-Generation Students’ conference last weekend. From Feb. 18 to Feb. 20, Dartmouth will host the 2016 Leila and Melville Straus 1960 Family Symposium focused on the rebuilding efforts and response to the April 2015 and May 2015 earthquakes in Nepal. The 7.8-magnitude earthquake and the 7.3-magnitude earthquakes both devastated Nepal, creating a humanitarian crisis where over 8,000 people were killed and over two million people were displaced. Emerging in 2012 from a social media hashtag, the slogan “Black Lives Matter” has become a rallying cry for larger issues related to police brutality, racial injustice and structural oppression that many feel disproportionately affect black communities. Many Dartmouth students, faculty, and staff have answered this rallying cry, participating in protests and demonstrations to stand in solidarity with the BLM movement and against alleged institutional oppression at the College. Klaus Milich, senior lecturer of American literary and cultural studies, began his term as the director of the Montgomery Fellows Program on Jan.1. He was announced as the new director last November. Dartmouth alumni, faculty and students were among the many delegates and attendees at the 2015 United Nations Climate Change Conference in Paris. After approximately two weeks of negotiations and meetings, the conference culminated in 195 countries adopting the first legally binding and universal agreement on slowing global warming. Thursday’s Blackout demonstration, organized by Dartmouth’s chapter of the National Association for the Advancement of Colored People, has sparked controversy after allegations of physical assault were made by users of social media outlets, like the anonymous messaging app Yik Yak, and later in an editorial in The Dartmouth Review, which on Monday gained traction from some national media outlets. In the NCAA’s recently released data from its annual student-athlete graduation rate survey, the College, along with Samford University, led Division I institutions with Graduation Success Rates of 99 percent for student-athletes who enrolled in 2008. This rate is 13 percent above the GSR for all of Division I athletics. 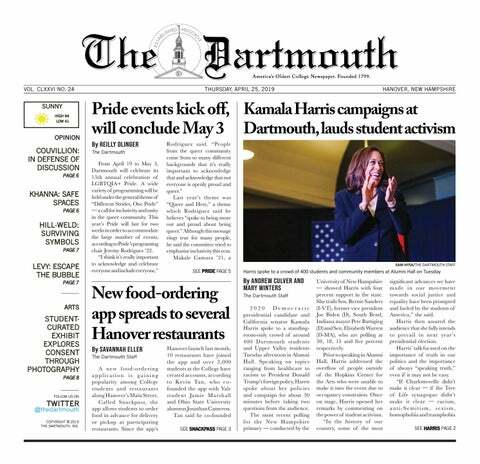 The Student and Presidential Committee on Sexual Assault called for increased campus preventive and response measures for sexual assault in its 2015 recommendations, released last week to the Dartmouth community. Former Big Green starting shortstop and baseball team captain Matt Klentak ’02 was named as the general manager and vice president of the Philadelphia Phillies on Monday — at 35, that makes him the youngest general manager in team history. A former researcher at the Center for Health Care Delivery Science is suing a senior member of the center’s staff and the College for a variety of alleged offenses stemming from her accusation of plagiarism against her employer.